Many of you are very familiar with how GoldSim has been used for many years to carry out simulations of environmental systems, such as mines, water supply systems and hazardous waste sites. However, because GoldSim was designed as a flexible probabilistic simulation system, there are many cool and interesting applications in a wide variety of other arenas. 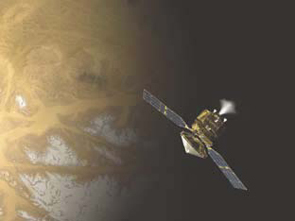 Perhaps one of the most interesting is the use of GoldSim for probabilistic risks assessments of space missions. Simulation Assisted Risk Assessment Applied to Launch Vehicle Conceptual Design: This early study demonstrated the use of physics-based simulation analyses (using GoldSim) to assess manned space exploration system failures (in particular, during the ascent phase of a mission). Engineering Risk Assessment of Space Thruster Challenge Problem. This paper describes a quantitative risk assessment developed using GoldSim to the Space Thruster Challenge Problem, which investigates mission risk for a deep space ion propulsion system. An Integrated Reliability and Physics-based Risk Modeling Approach for Assessing Human Spaceflight Systems. This paper presents an integrated reliability and physics-based risk modeling approach that uses GoldSim for assessing human spaceflight systems. The approach is demonstrated using an example risk assessment of a generic crewed space transportation system during a reference mission to the International Space Station. Comparative Analyses of Static and Dynamic Risk Assessment. This study compares and contrasts three different approaches for the probabilistic safety assessment of crewed spacecraft: traditional static fault tree; fault tree hybrid, and dynamic Monte Carlo simulation (using GoldSim). These applications all make use of the GoldSim Reliability Module, which was originally developed with a NASA- funded Small Business Innovative Research (SBIR) grant with the Jet Propulsion Laboratory. This module allows you to probabilistically simulate and analyze the reliability and performance of complex engineered systems over time. In addition to space systems, it has also been applied to other applications, such as evaluating the performance of photovoltaic system designs and reliability throughput modeling for industrial facilities. The Reliability Module Learning Edition is included with all versions of GoldSim (at no extra cost), so you can easily explore and experiment with this powerful module.